As with all of Azure, we are continuously innovating, upgrading, and refining our virtual network gateways to further increase reliability and availability. Today, we are sharing the public preview of zone-redundant VPN Gateway and ExpressRoute virtual network gateways. By adding support for Azure Availability Zones, we bring increased resiliency, scalability, and higher availability to virtual network gateways. 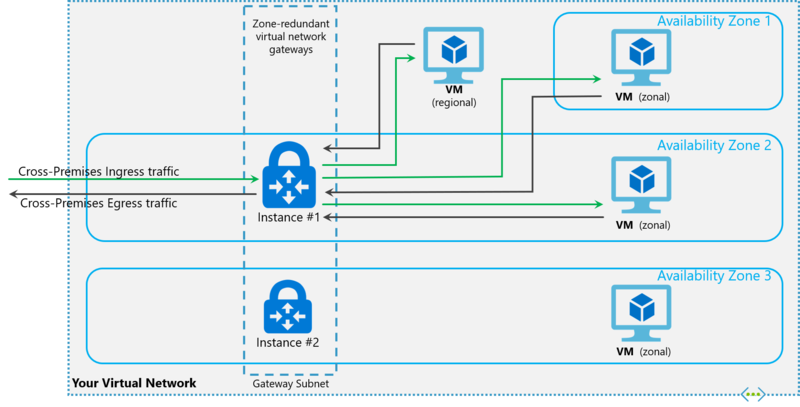 You can now deploy VPN and ExpressRoute gateways in Azure Availability Zones. This physically and logically separates them into different Availability Zones protecting your on-premises network connectivity to Azure from zone-level failures. Additionally, we have made fundamental performance improvements including reducing the deployment time to create a virtual network gateway. To automatically deploy your virtual network gateways across availability zones, you can use zone-redundant virtual network gateways. Zone-redundant virtual network gateways use specific new gateway SKUs for VPN Gateway and ExpressRoute. To begin using zone-redundant, you can self-enroll your subscription in the public preview. Once you enroll, you will start seeing the new gateway SKUs in all the Azure Availability Zone regions. See the getting started guide for steps to self-enroll, to view information about the new gateway SKUs, and for configuration information. The new gateway SKUs also support other deployment options to best match your needs. When creating a virtual network gateway using the new gateway SKUs, you also have the option to deploy the gateway in a specific zone. This is referred to as a zonal gateway. When you deploy a zonal gateway, all the instances of the gateway are deployed in the same Availability Zone. We look forward to you trying out the new gateways, and to receiving your precious feedback!